Eleanor Blayney, CFP® is the Consumer Advocate for the Certified Financial Planner® Board of Standards, reaching out to consumers to help them understand how financial planning and CFP® professionals can improve their lives. The author of Women’s Worth, a book about how women can make the most of their financial lives, Eleanor worked with individual clients for more than 20 years to help them articulate and plan for their financial goals. As the only woman partner in a four‐partner firm, Eleanor drew upon her female intuition, communication strengths, and facility for sustaining relationships to help build a wealth management firm that has served hundreds of clients in the Washington, D.C. metro area and around the country. Passionate about finding ways to foster gender parity in the financial planning profession, Eleanor helped to spearhead CFP® Board’s Women’s Initiative (WIN) to address the industry’s “feminine famine.” On behalf of the WIN Advisory Panel – comprising leaders in the area of women in financial services – Eleanor authored Making More Room for Women in the Financial Planning Profession, a 2014 white paper which presents the findings of a comprehensive research study on why there aren’t more women CFP® professionals and offers the WIN Advisory Panel’s recommendations to help attract more women to the profession. Eleanor holds a number of degrees and designations. She earned an MA in English Literature from the University of Cambridge UK and an MBA from the University of Chicago. She is a Certified Financial Planner™ professional. 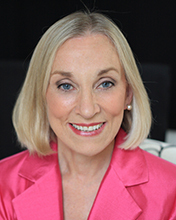 Well‐known as a conference speaker and frequently quoted in the news media, Eleanor has played a pioneering role in building and shaping the financial planning profession. She has taught for the College of Financial Planning, and has helped to develop practice standards and ethical requirements for CFP® professionals in the U.S.